We are delighted by the overwhelmingly positive response we have received following the introduction of the first e-newsletter that was published in October 2016. Encouraged by your favourable reaction, we are planning to publish further e-newsletters at regular intervals. After being made so welcome last year, the fifth annual Introduction to Ignatian Spirituality Retreat will once again be held at Mayfield School set in the heart of the Sussex countryside 50 miles south of central London. 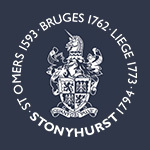 The 50th anniversary race between Ampleforth and Stonyhurst which is also the 40th anniversary of the Stonyhurst Invitation will take place at Stonyhurst on Saturday 27th February 2016 with a dinner for all runners and guests at the College afterwards. Members of the Association gathered in Bath for a Convivium on 25 March at a very fine and convenient venue – The Brunswick Room in the Guildhall. THERE WERE 1,012 Stonyhurst men serving in the Forces during the First World War. 168 of them were killed or died on active service (with another 39 deaths listed).